Ariana has been modelling for most of her life. As her career grew, so did her shoe collection. Not willing to part with any of her precious footwear, yet looking to downsize her life in general, she needed to figure out a solution that would free up some space in her home, yet still allow her to retain her collection. Being a model who travelled constantly, Ariana had chosen to live in a condo rather than a house, because maintenance could be handled by the condo association and she wouldn’t have to worry about anything. The only drawback to that was a serious lack of storage space. As any girl can tell you, shoes are VERY important, and we don’t just let someone off the street touch them! They need to be handled and stored with care so that they’re ‘ready to wear’ at a moment’s notice. Ariana didn’t want her shoe collection to be too far away, and she wanted to take her time sorting through the hundreds and hundreds of pairs she’d amassed over the years. Some would remain with her in her condo, but for the most part, they bulk of them needed to be stored away. While doing research on the best method and storage location for her shoes, Ariana came upon the Big Box Storage website. As she read through the site, she realized that a Big Box Storage was the perfect solution! Big Box Storage could deliver a box to Ariana on short notice, and would leave it with her while she took her time sorting and packing her shoes for safe storage. Knowing how simple Big Box Storage would make the task before her, Ariana was able to take her time planning and organizing. First, she called Big Box Storage to discuss what types of packing materials she’d need. Big Box Storage offered a wide range of packing supplies including many different sizes of boxes, bubble wrap, tape, twine, markers, you name it. Since Ariana was storing a very valuable shoe collection, she opted to use her own plastic sealable shoe boxes that would then be packed inside carefully labelled cardboard boxes provided to her by Big Box Storage. Big Box also provided her with helpful tips on how to organize the boxes within the storage container so as to enable Ariana the best access should she need to find a pair of shoes quickly. Armed with her packing materials and helpful tips, Ariana began packing away her precious collection. Knowing that nobody else would be handling her shoes gave Ariana a great deal of peace of mind. Some of her shoes were worth thousands of dollars after all, and each pair marked a milestone in her rising career as a model. And even though things were slowing down for her as a model, she’d still have easy access to all the wonderful memories each pair of shoes brought to mind. Taking her time, Ariana was able to pack her entire collection based on the color of each pair of shoes. Once Ariana got a feel for how easy the whole process was going to be, she gave Big Box another quick call, and the very next day her storage unit was at her home and ready for her to begin loading. To Ariana, it almost felt too easy! But, before she knew it, her entire collection was securely packed inside the Big Box Storage unit and ready for scheduled pick up the next day. With a huge feeling of accomplishment, Ariana surveyed her handy-work. “Wow” she thought to herself, “that was just too easy!” All thanks to Big Box Storage! 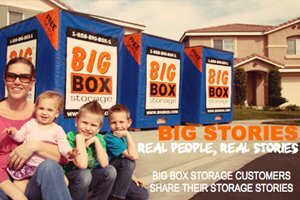 Big Box Storage can help you with ALL your storage needs right down to providing you with the right types of packing materials to keep your belongings safe. They’ll bring your storage unit right to your door where you can pack it at your own pace on your own schedule. Then when you’re done, it’s a simple as a phone call to have Big Box Storage come back out to pick up the unit. And, if Ariana ever decides to move long distance, packing her shoe collection will be one less thing she has to worry about, since Big Box Storage offers long distance shipping at incredibly competitive rates. They’ll deliver the unit right to Ariana’s destination, where she can unpack it at her leisure. Here's another great storage story by another satisifed Big Box Storage customer!